These little guys are TASTY! Weight Watchers has these little one-point lemon snack cakes (along with chocolate, caramel and carrot) and the lemon are by far my favorite. They remind me of Zingers, without the filling (and now I see that Zingers has a 100-calorie version - need to try those). The lemon flavor is subtle, and I really enjoy the icing on top. These are sold in some stores in the freezer, but I much prefer these at room temperature. Not filling at all, they do hit the spot when you want a little tasty bite. 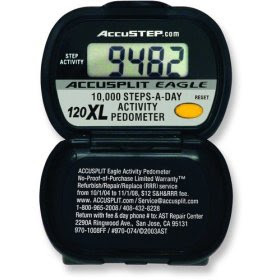 Walking is pretty much the easiest exercise you can get, and I highly recommend buying a pedometer. Mine is a simple one from the folks at Accusplit. I track my steps every day and try to aim for an average of 10,000 steps a day (over a week). This week I've been not hitting even half that because of the crappy weather, but last Sunday I hit 19k. It was invaluable when we went on vacation - we walked over 154 miles in 14 days, and seeing those numbers kept us motivated to keep on walking instead of taking the subway.